CCRI offers a certificate and an associate in applied science degree in Chemical Technology. Either program can be taken on a part- or full-time basis, but the program is designed to allow students to fit their education into their busy lives. It is recommended that all students initially enroll in the certificate program because employers often do not discriminate between certificate- and degree-holding job candidates. Students can continue on to earn the associate in applied science degree. The A.A.S. 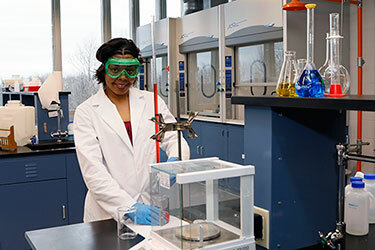 degree in Chemical Technology transfers to most four-year institutions as the first two years of a traditional baccalaureate program in Chemistry. For more information contact Program Coordinator Wayne Suits at 401-825-2010 or wsuits@ccri.edu.